NEWARK, Ohio (CN) – An Ohio historical group claims in court that a country club refuses to agree to an early end to its lease of a golf course covering an “enormous, geometric earthworks” built by Native Americans 2,000 years ago. The petition to appropriate property – filed Wednesday by the state attorney general’s office in the Licking County Court of Common Pleas – says the Ohio History Connection must use eminent domain to acquire the leasehold estate and allow the historic site to be internationally recognized and open to the public. 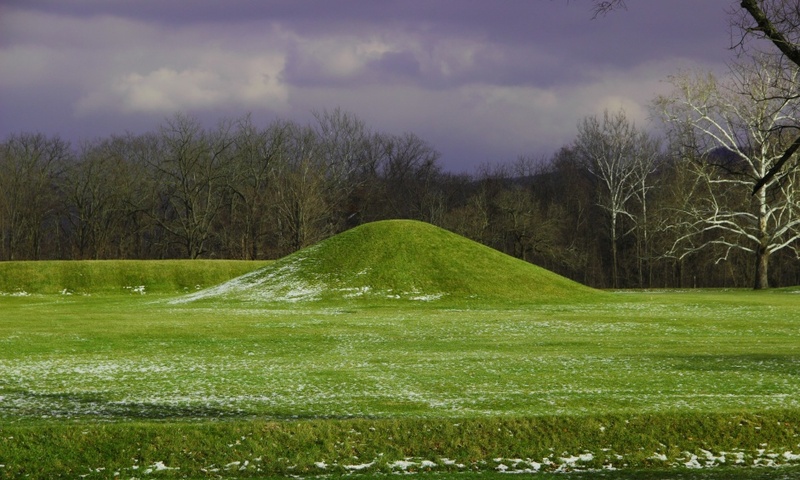 “The Octagon Earthworks demonstrate the Hopewell culture’s sophisticated understanding of geometry and astronomy, and are a remarkable testament to the architectural and engineering genius of the ancient American Indians who lived in Ohio,” the lawsuit states. In May, the U.S. Department of Interior said it selected the Hopewell Ceremonial Earthworks – which consists of eight sites in Ohio, including the Octagon Earthworks – as its next proposed nomination to UNESCO’s World Heritage List, which recognizes sites around the world with value to humanity. The U.S. has 23 World Heritage sites. The Hopewell Ceremonial Earthworks would be the first in Ohio. The Ohio History Connection says it became owner of the land in 1933, when it acquired it via deed from Newark’s Board of Trade. Before that, the trade board had leased the land to what is now called the Moundbuilders Country Club, which is named as a defendant in the lawsuit alongside Park National Bank. Through the years, the country club has been given the right to renew the lease until 2078. The Moundbuilders Country Club is private and is generally only open to members and their guests. “While the private country club members have full access to the property, the property is only open for full access to the public during four days, dawn to dusk, during the calendar year, with dates to be designated by agreement of both the Ohio History Connection and Moundbuilders Country Club Company,” the complaint states. When the property is not open to the public, those who are not members of the country club “may access a small observation platform on the edge of the property and a short trail at the edge of the property, but from the viewing platform and trail, members of the public can only see a fraction of the 125-acre earthwork complex,” according to the lawsuit. The state historical group claims the country club paved over some of the ancient earthworks for a golf cart path, and many of the earthen enclosure’s walls are within the course’s area of play. The historians noted that the Octagon Earthworks can never be relocated, but the golf course can, and that Moundbuilders “is one of approximately nineteen golf courses in Licking County, most of which are open to the public,” and at which the members of Moundbuilders can play golf. The historical group hopes to turn the property into a public park, remove the golf course and restore and preserve the earthworks. This would allow “new scientific and archeological research on the site that cannot be done while the golf course is present,” it says. The Ohio History Connection also says it could build educational facilities on the site, including a museum. “The Octagon Earthworks will not achieve World Heritage status if there is a lease on the property with Moundbuilders Country Club Company and if there is a golf course on the property,” according to the complaint. The plaintiff asks the court to order appropriation of the property and determine how much it should pay Moundbuilders Country Club to buy out the lease. Representatives from the Ohio History Connection and the country club were not available for comment Thursday.